49ers quarterback Jimmy Garoppolo is expected to be ready for OTAs, as Jennifer Lee Chan of NBC Sports writes. As a QB, Garoppolo should be able to participate in OTA drills, but the risk factor is higher for teammate Jerick McKinnon. The running back, Shanahan says, is unlikely to be involved in the 7-on-7 scrimmages. The 49ers haven’t reached out to the Steelers about wide receiver Antonio Brown, but that doesn’t mean they won’t, Shanahan says. “We’re in the market for anything that makes our team better at every single position,” Shanahan said (via Eric Branch of the San Francisco Chronicle). 49ers cornerback Richard Sherman says he’s had talks with the team and that both sides would like to continue together in 2019 (Twitter link via ESPN.com’s Josina Anderson). Sherman signed a three-year deal with SF in March of 2018, but his ’19 salary is not guaranteed. As it stands, he’s scheduled to carry a $9.8MM cap figure this season. No surprise here, but former first-round pick Arik Armstead will be back with the team in 2019. “We’re not into losing good players, and he has played very well for us,” Shanahan said of the defensive lineman (via Matt Maiocco of NBC Sports). “I think he can take it to a whole ‘nother level and I hope to see him do that this year. If he does, that will be very good for the Niners and very good for him because he’s got the ability to do it. He’s already done some very good things for us in these two years. Hopefully, this year he can stay healthier. Hopefully, the addition of changing our style a little on the D-line will help him. And I expect him to get better.” One year ago, the Niners picked up the non-binding fifth-year option on Armstead’s contract. In two weeks, he’ll have his $9.046MM salary guaranteed for 2019. Drew Brees will carry an NFL-high $33.5MM cap charge in 2019, but the Saints could potentially make moves to reduce that hit, as Josh Katzenstein of NOLA.com writes. “We’ll see what happens,” general manager Mickey Loomis said Wednesday. “We know it’s coming at some point, and we’ve kind of kicked the can down the road a number of times, haven’t we?” Indeed, New Orleans has pushed Brees’ cap charges into future years on multiple occasions. Just last year, Brees inked a two-year contract which includes a voidable year in 2020, which allowed the Saints to move $10.5MM of Brees’ commitment to that season’s books. As Loomis notes, New Orleans has “a lot of mechanisms to maneuver the cap,” so another extension or restructure could be in the offing. The 2018 season marked the first NFL campaign without DeAngelo Hall‘s involvement since 2003. The recently retired Redskins safety may be eyeing a return to the league as a coach. Hall said (via Grant Paulsen of 106.7 The Fan, on Twitter) he interviewed for a position as Redskins secondary coach on Tuesday. The team, though, went with Ray Horton to oversee its defensive backs. Hall, 35, also could begin his coaching career at the college level, indicating he interviewed for a job on Maryland’s staff as well. After Hall passed on the Terrapins’ offer, in hopes of pursuing the Redskins’ position, the Big Ten program went in another direction (Twitter link via Brendan Darr of 106.7 The Fan). So, Hall remains an interesting coaching free agent. Kliff Kingsbury already received a commitment from a 2004 first-round pick to help his offense, with Larry Fitzgerald re-signing with the Cardinals for 2019. Seeking more help for his first Arizona offense, Kingsbury met with another member of that ’04 first-round contingent. J.P. Losman interviewed for a position on the Cardinals’ offensive staff, Ian Rapoport of NFL.com tweets. Currently serving as a Clemson staffer, Losman, 37, was a Bills first-rounder 15 years ago. The 49ers may see their quarterback on the field by OTAs. That is the goal for a Jimmy Garoppolo re-emergence, John Lynch said on the RapSheet and Friends Podcast (via NFL.com). Lynch confirmed Garoppolo has not endured any setbacks on his recovery from a September ACL tear. This is the latest update indicating Garoppolo participating in OTAs was a realistic possibility. 49ers quarterback Jimmy Garoppolo has a “real good chance” to participate — at least, on a limited basis — during San Francisco’s 2019 organized team activities in late May/early June of 2019, head coach Kyle Shanahan told Nick Wagoner of ESPN.com (Twitter link). Garoppolo suffered a torn ACL in late September, so returning at the end of the May would give him roughly eight months of recovery. As Shanahan notes, quarterbacks like Garoppolo aren’t necessarily going to need the same amount of recovery time as a player at another position that needs to run and cut, so May seems like a realistic target date. Shanahan also told reporters that he hasn’t necessarily considered an extension for defensive lineman DeForest Buckner, but was quick to add that Buckner is someone the 49ers want on their roster “for a long time,” tweets Matt Barrows of The Athletic. Buckner will become eligible for a new deal when San Francisco’s season concludes, but there’s no rush, as he’ll be under contract through 2020 when the 49ers inevitably exercise his fifth-year option for 2020. The No. 7 overall pick in the 2016 draft, Buckner has become an under-the-radar superstar in his third NFL campaign, ranking fifth among interior defenders in tackles for loss and seventh in quarterback hits. Seahawks linebacker K.J. Wright could be available to play against the Chiefs on Sunday night, according to Brady Henderson on ESPN.com. “The ramping up has worked out fine and he’s ready to go,” head coach Pete Carroll said. Wright underwent knee surgery in August and subsequently missed Seattle’s first seven games. He came back in Week 8 and managed to play in three straight contests, but struggled during that time. Now that he’s been given several more weeks to rest, Wright could be fully ready for the stretch run and the postseason. While Wright is set to return to action in the near future, the same can’t be said for Chargers linebacker Kyzir White. Although White is eligible to come off injured reserve in time for the postseason, that course of action doesn’t appear likely, per Eric D. Williams of ESPN.com (Twitter link). A fourth-round rookie out of West Virginia, White had played extremely well in three NFL starts (especially in coverage) before going down with a knee injury. With both White and fellow ‘backer Denzel Perryman out for the year, Los Angeles has been deploying a single-LB defense, with only Jatavis Brown seeing more than 25% playtime over the past several weeks. Raiders owner Mark Davis says he doesn’t regret trading edge defender Khalil Mack nor wide receiver Amari Cooper, according to Ian Rapoport of NFL.com (video link). Oakland received a bevy of picks for Mack and a first-round selection for Cooper, and will now have three first-rounders in the 2019 draft. However, both the Bears (who acquired Mack) and the Cowboys (who received Cooper) are now headed for the postseason, meaning the value of their picks that were sent to the Raiders has decreased. The obscene parting shot that Seahawks safety Earl Thomas made in the direction of his team’s bench as he was being carted off the field last week was not directed at any one person or player, but at the Seattle organization as a whole, per Adam Schefter of ESPN.com. And, even though all signs were already pointing towards a parting of the ways between Thomas, who will be a free agent at the end of the season, and the only NFL team he has ever known, Schefter reports that the Seahawks are not expected to use the franchise tag on Thomas, which all but ensures that he will not return to Seattle in 2019. Ian Rapoport of NFL.com tweets that Thomas will have surgery to have a rod inserted in his leg this week, which will increase his chances of healing while lowering his chances of a re-fracture, so he is expected to be fully healthy well before free agency officially opens in March. Seahawks LB Mychal Kendricks was hit with an indefinite suspension earlier this week, and Schefter reports that Kendricks, his lawyers, and the NFLPA are still battling to prove that the NFL does not have the right to impose such a ban in his case. Instead, Kendricks is arguing that the league should suspend him for a specific number of games, thereby allowing him to return to action this season and play until he receives his sentence for insider trading in January. 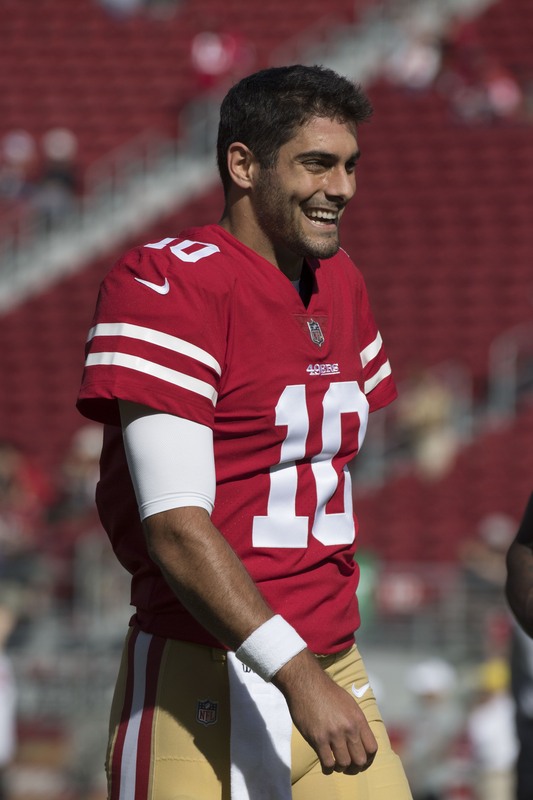 In keeping with a report from several days ago that 49ers quarterback Jimmy Garoppolo underwent successful surgery on his torn ACL, Rapoport tweets that Garoppolo faces a relatively obstacle-free rehab. His ACL was the only thing that needed to be repaired, so he is expected to make a full recovery. We heard at the end of last month that there was no definite timeline for Vikings defensive end Everson Griffen to return to the team, and Schefter reported today that Griffen is not expected to return anytime soon. Griffen, of course, is tending to apparently serious mental health issues. Lions guard T.J. Lang suffered at least the fifth concussion of his career last week, and assuming he wants to continue his career, Kyle Meinke of MLive.com believes 2018 will be his last season in Detroit. Lang is under contract through 2019, but he missed games last year because of brain, back and foot issues, and he is dealing with brain and back issues again this year. He would carry a cap hit of $11.7MM in 2019, and Meinke does not envision Detroit ponying up that kind of cash given Lang’s recent spate of injury problems. The Buccaneers recently worked out former first-round draft choice Paxton Lynch, but Rick Stroud of the Tampa Bay Times reports that the Bucs have no interest in signing Lynch at this time. There were high hopes for the 49ers in 2018, hopes that were mostly dashed when Jimmy Garoppolo was lost for the season with a torn ACL. The team has insisted they have confidence in backup C.J. Beathard, but the new-look 49ers will almost certainly have to wait until next year to make a serious run at a playoff spot. The good news is that Garoppolo recently underwent surgery, and everything seems to have gone very well. San Francisco’s GM John Lynch said he spoke to the doctor who performed Garoppolo’s surgery, and that he got a “great report” from the surgeon according to Eric Branch of The San Francisco Chronicle. Lynch added that doctors are “very optimistic about the prognosis for his future.” Separately, Branch notes that coach Kyle Shanahan said the team is hoping Garoppolo will be able to participate in OTAs in some capacity. It sounds like Garoppolo is expected to make a quick recovery and be 100% well before the start of the 2019 season, which is music to the ears of 49ers fans. Earlier today, Cowboys owner Jerry Jones made clear the team wouldn’t be bringing back Dez Bryant despite the receiver’s eagerness to return to Dallas. Now his son Stephen Jones, the team’s player personnel boss, has elaborated on why. The younger Jones said it has a lot to do with quarterback Dak Prescott, saying “the last thing unfortunately that Dak needs right now is to continue to change a lot of things up again.” The Cowboys’ receiving corp has been much maligned, but it sounds like it will be staying as is. Cowboys defensive tackle David Irving is coming back from suspension this week. It’s a huge boost to Dallas’ defense, but to make room for him on the roster they’ll have to make a tough decision. It’s getting close to game day and they still haven’t made the call, so David Moore of Dallas News broke down all their potential options. Jones has said Irving will play, so something will need to be done in the next 36 hours or so. “A federal judge has denied Eagles OT Lane Johnson’s motion to vacate an NFL arbitration award for his 10-game suspension in 2016″ according to Liz Mullen of Sports Business Journal (Twitter link). Johnson filed the suit last year, alleging his suspension for PEDs was unwarranted, and that there was bias by the judge in the appeals process. The 49ers’ worst fear has been confirmed. On Monday, an MRI revealed that quarterback Jimmy Garoppolo has suffered a season-ending ACL tear, as Adam Schefter of ESPN.com tweets. 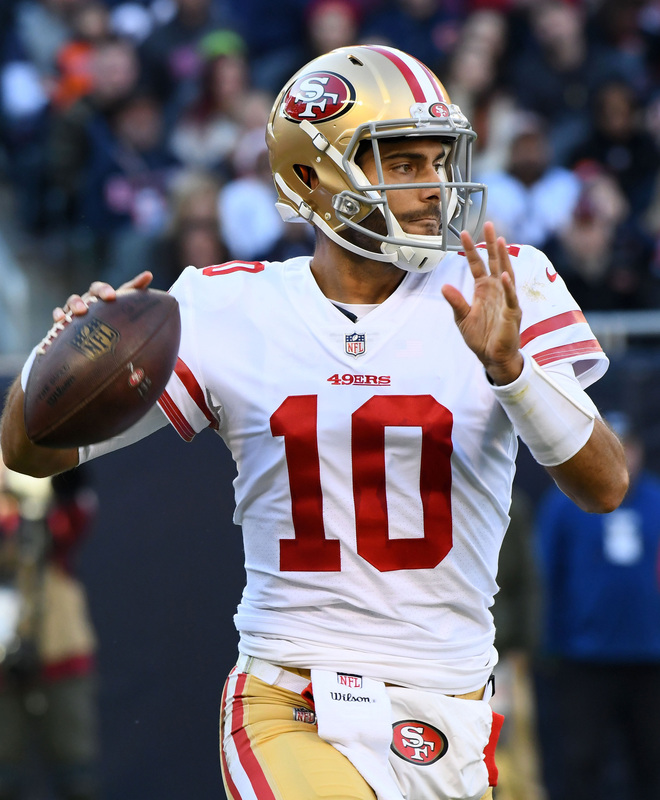 The Niners will place Garoppolo on injured reserve, opening up a spot on the roster that will surely be filled by another quarterback. The 49ers, for now, will turn the starting job over to backup C.J. Beathard. After the second-year QB went 1-4 in five starts last year, it’s far from an ideal situation for San Francisco. If the 49ers seek outside help, they may want to give the Browns a call to see what it would take to acquire Tyrod Taylor, who has lost his starting job to rookie Baker Mayfield. The free agent market, which may or may not include retired signal caller Jay Cutler, doesn’t have much to offer the 49ers. Colin Kaepernick may represent the most talented available QB at this time, but he’s unlikely to return to SF for obvious reasons. On Sunday, we heard that the Niners are unlikely to bring in competition for Beathard, but that thinking could easily change. The 49ers picked up Garoppolo from the Patriots in exchange for a second-round pick last November, and subsequently inked him to a five-year, $137.5MM extension. Tom Brady‘s former protege won all five of his starts in the Bay Area last year, but was off to a so-so start in 2018. In three starts, Garoppolo went 1-2 with three interceptions against five touchdowns. The 49ers are dealing with the devastating loss of Jimmy Garoppolo to a torn ACL that will cut his 2018 short. 2017 third round pick C.J. Beathard stepped in to replace Garoppolo against the Chiefs and will now move up to number one on San Francisco’s depth chart. Despite Beathard’s lack of success as a starter last year, it doesn’t look like the team will be bringing in any outside competition to push Beathard for the starting job. While he notes the 49ers will “obviously” need to bring in an additional signal caller to back Beathard up, Eric Branch of the San Francisco Chronicle passes along that 49ers coach Kyle Shanahan said he “didn’t anticipate 49ers bringing in a QB to compete with C.J. Beathard as starter” (Twitter link). 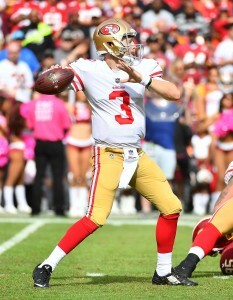 Beathard, a former Iowa Hawkeye, started five games for the 49ers last year and appeared in seven. He completed 54.9% of his passes for 1,430 yards, four touchdowns, and six interceptions. The 49ers won just one of the games he appeared in, and he mostly struggled during his time as the team’s starter. After the 49ers acquired Garoppolo in a trade with the Patriots, Beathard quickly relinquished his starting duties. There was a ton of optimism surrounding the 49ers heading into 2018, as they were expected to make a major leap in Shanahan’s second season. They lost a close game to the Vikings in Week 1 and beat the Lions last week to improve to 1-1. They now sit at 1-2 and face a tough upcoming schedule, with three out of their next four games against the Chargers, Packers, and Rams. With no big-name signing or trade forthcoming, it looks like it’ll be Beathard the rest of the way. The 49ers fear starting quarterback Jimmy Garoppolo suffered a serious knee injury in Week 3’s contest against the Chiefs, according to Ian Rapoport of NFL.com (Twitter link). Head coach Kyle Shanahan admitted following the game that an ACL tear is the fear for Garoppolo, and an MRI could confirm the news by Monday. Garoppolo took a hit while running along the sideline in the fourth quarter of Sunday’s game and looked to have injured his left knee. Trainers escorted him off the field via cart, and he was quickly ruled out for the remainder of Week action. Losing Garoppolo would be a devastating blow for a 49ers team that had playoff aspirations entering the 2018 campaign. San Francisco has already lost one if its projected offensive focal points — free agent addition Jerick McKinnon — for the year after he suffered a torn ACL during training camp. Another knee injury, this time to Garoppolo, could further derail San Francisco’s postseason hopes. With Garoppolo sidelined, the 49ers turned to backup C.J. Beathard for the remainder of their loss to the Chiefs. Beathard, a third-round pick in the 2017 draft, started five games for San Francisco before it acquired Garoppolo near last year’s trade deadline. The Iowa product completed 55% of his passes for 1,430 yards, four touchdowns, and six interceptions, and posted the second-lowest passer rating among NFL quarterbacks with at least 200 attempts. The 49ers picked up Garoppolo from the Patriots in exchange for a second-round pick last November, and subsequently inked him to a five-year, $137.5MM extension after he won all five of his starts in the Bay Area. Through two starts this season, Garoppolo had managed 467 yards, three touchdowns, and three interceptions. Two rookies remain unsigned: Sam Darnold and Roquan Smith. The Jets are working on a deal with a quarterback they’ve been thrilled about throughout the offseason, one who was supposed to have a legitimate chance at a Week 1 starting job, but Darnold’s camp absence isn’t doing him any favors. Offset language was thought to be a sticking point here, but NFL.com’s Ian Rapoport notes (video link) that isn’t the case (or isn’t any longer). Instead, the quarterback’s guarantees — and how and when they would void — represent why the former USC standout hasn’t signed. Void issues have also come up in the Bears’ discussions with Smith. CAA represents both Darnold and Smith. The Jets began their first practice this afternoon. A former AFC East quarterback was not planning to leave during what turned out to be his final offseason in the division. Jimmy Garoppolo was searching for Boston-area real estate last summer, Joon Lee of Bleacher Report notes. Ben Volin of the Boston Globe adds this should help put an end to speculation the Patriots were planning all along to unload their former backup quarterback. Volin writes Bill Belichick was indeed overruled about a plan to keep Garoppolo as the heir apparent — which would have induced complex math because of the current 49ers quarterback’s rookie contract expiring and Tom Brady not yet retired — before an 11th-hour trade to San Francisco. Brady did not deny that he communicated with Josh McDaniels during the period after the Super Bowl when he backtracked on accepting the Colts’ HC job, the longtime Patriots quarterback said Saturday (via James Palmer of NFL.com, on Twitter). When asked if he spoke with his then-outgoing OC about potentially staying in New England instead, Brady said he “always” talks to McDaniels, who is now back for a seventh season in his second stint as Pats OC. Julian Edelman addressed his suspension Saturday and said this second straight September off will allow him to get his knee fully ready to go. “It’s disappointing with the penalty and the findings,” Edelman said, via Doug Kyed of NESN.com. “And I’m definitely accountable for that. I have to follow the protocols a little better and make sure this never happens again.” Edelman contested the suspension but saw his appeal fail. The 10th-year slot receiver tore an ACL during the 2017 preseason but is expected to be ready to go upon his now-October debut date. Josh Allen‘s been the best Bills quarterback in camp thus far, Joe Buscaglia of WKBW observes. The raw Wyoming-honed talent outshined A.J. McCarron and Nathan Peterman on Saturday, per Buscaglia. Both of the older QBs are believed to be competing for Buffalo’s Week 1 job, with Allen believed to be set to watch as his career begins.